We have talked a little bit before about respite care. The word ‘respite’ means to rest or to take a break from something. Respite care offers people who are full-time caregivers to ailing family members just that: a chance to take a break and rest for a bit. And we at Best In-Home Care know how important that rest can be. Why Do I Need A Respite Caregiver? So then why do we feel the need to take care of our own parents seven days a week? We have our reasons – we love them, we care about them, we don’t want anything bad to happen to them while they’re alone. In fact, even if we tell them not to, our kids will probably end up devoting their lives to taking care of us one day! It makes sense, and we are usually happy to do it and couldn’t imagine it any other way. But that doesn’t mean you need to spend every hour of your week with your aging parents. Just like any other job, it is important to have a life of your own. You will be a better caretaker if you also take care of yourself. Respite care doesn’t mean you can’t handle the responsibility of taking care of your parents or aging relatives. Respite care can actually improve your relationship with your ailing parents because it gives you a chance to rejuvenate. Respite care can range from a few hours a day to a few hours a week, and offers caregivers the ability to leave their aging parents without worrying about what will happen to them. When you take time away from your parents, whether it is to run errands or relax, you shouldn’t have to burden your mind with thoughts of, “What if they fall? What if they need something? What if they get lonely?” That doesn’t sound very relaxing at all! 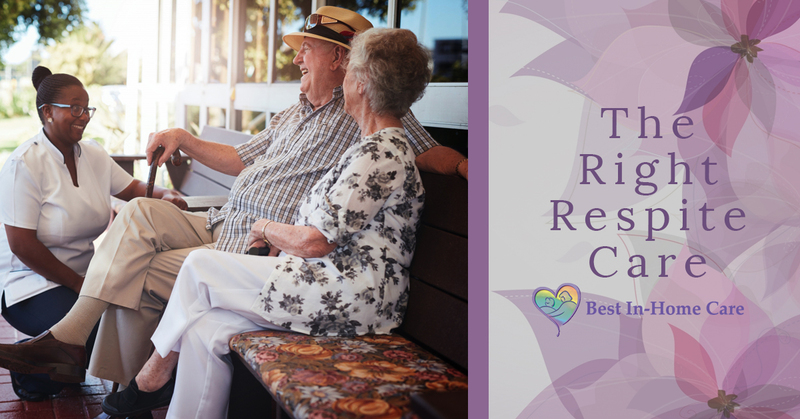 Our respite caregivers are trained, friendly, and reliable. They will make sure your family member is safe while you’re away, so you don’t have to worry about them being left alone. We believe that Best In-Home care has the best caregivers in Texas. If you are taking care of an aging relative in Lubbock and are in need of respite care, contact us today. Our passionate caregivers will spend meaningful time with your loved one, ensuring that any necessary duties are performed to keep them comfortable and smiling. Remember, taking care of a parent isn’t something you have to handle alone. Making sure you are still living your life is key to having a healthy and fulfilling relationship with your loved one in their remaining years. Taking a few hours every week to take care of yourself will give you time to relax, to breathe, to rejuvenate, and to look forward to coming home to your parent again.